Harley-Davidson has dominated the class of late behind riders Andrew Hines and Eddie Krawiec. The two have combined to win every race this season, seven if you are counting at home. Krawiec took the honors last weekend in Denver, defeating Hines in the finals. Krawiec tops the Pro Stock Motorcycle standings, with Hines in second place, just 44 points back (714-670). “Talk about a dream season, we never expected it to go like this,” said Krawiec , who has four wins this season in four final-round appearances. With all the success Krawiec has enjoyed, including two NHRA championships, he has never won in Sonoma. He has been runner-up twice, most recently in 2009, when he lost to Hines. 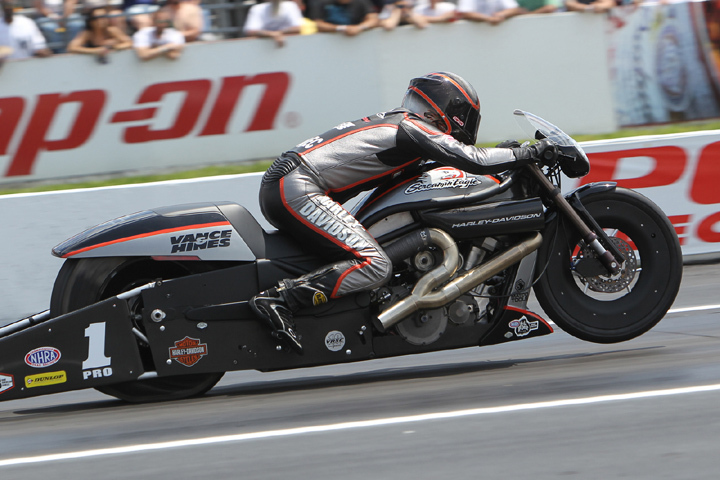 Hines, meanwhile, is a three-time NHRA world champion and entered the 2012 season with 28 career wins. Pro Stock Motorcycle wins in Sonoma have proved elusive, however, with eight different winners in nine races. Hines is the only rider with two victories in Sonoma (2009, ’05). Hines are Krawiec are chased in the standings by Hector Arana Jr. (574) and his father, Hector Arana (510), who sit in third and fourth place, respectively. Karen Stoffer (396) rounds out the top five. Arana Jr. was second in the championship points battle last year and was also the NHRA’s Rookie of the Year for the Pro Stock Motorcycle class.